This issue explores a variety of practices: study and contemplation, ethical living, pilgrimage, chanting, not to mention mindfulness meditation. It also includes a special section on audio dharma. 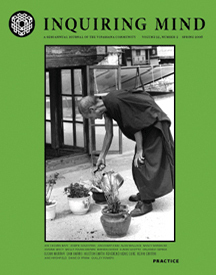 Cover art: Sabina Lanier, “Monk Watering Plants.” Photograph. Four extraordinary teachers of Buddhadharma—Jan Chozen Bays, Joseph Goldstein, Jon Kabat-Zinn and Alan Wallace—engage in a spirited conversation on mindfulness and how it operates in our lives. Inquiring Mind interviewed Bhikkhu Bodhi upon the publication of his new anthology of sutta passages, In the Buddha’s Words (Wisdom, 2005). For midwife Nancy Bardecke, assisting birth and attending death are as much a part of her practice as going on retreat. Baseball Hall of Famer Orlando Cepeda shares his enthusiasm for Nichiren Buddhist chanting practice. Zen teacher Susan Murphy reflects on our sense of place. Rev. Heng Sure converses over a wide range of themes with religion “sage” Huston Smith. Dharma teacher Kevin Griffin wonders whether he’s a lousy meditator. Barbara Gates is crazy about dogs—especially rescue pups. She finds that training a pup and training the mind are much the same. Tom Hendrickson remembers the first time he met Joseph Goldstein, “a man who embodies his teaching,” and reflects on the lasting value of The Experience of Insight. “In a way, Ananda is the patron saint of audio dharma,” says Ajahn Amaro, talking with us about the oral tradition. Ines Freedman describes the Redwood City Insight Meditation Center’s thriving audio dharma program, reflecting on how this form of teaching can impact our practice. Special thanks to Ajahn Sudanto of Abhayagiri Buddhist Monastery for compiling this list of links. Andrew Olendzki writes about Dharma Seed’s 1984 beginnings, its growth and its transition into being a dana-supported distributor of recorded dharma talks. Mindful Healing Series, by Bob Stahl, Ph.D.
Quilly Powers commits to Uposatha Days, examining habits and choices as they arise. Just a few simple changes in a day’s activities can bring so much more mindfulness. With characteristic humor, Wes Nisker muses on meditation as an “evolutionary sport,” identifying as an earthling, a mammal, a vertebrate, a bag of bones and seawater, an itty-bitty bit player in the big story of life on Earth.